I drew this at like 3am during one of the last nights when I couldn't sleep... maybe I will color it but for now, enjoy Simba in black and white! I am especially satisfied of the mane. The shading was made with a graphite lead pencil. Thank you! 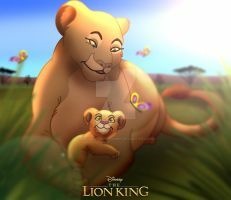 I practice a looooot with Simba! A good faithful sketch of Simba here.